In this section, we cover the major attractions of Key Largo, tell you more about Key Largo, and cover some of its history. The Key Largo area, being located so close to Miami and other parts of South Florida, is a popular weekend getaway for residents of those areas, but it also draws visitors from all over the world. 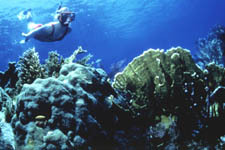 Key Largo offers excellent fishing, scuba diving, snorkeling and other outdoor opportunities. It is perhaps best known for its diving, snorkeling and great restaurants. John Pennekamp Coral Reef State Park (MM 102.5 Oceanside), a major area attraction, has spectacular coral reef wildlife that cannot be found anywhere in the United States except in the Florida Keys. The State of Florida has a web site for the park, but a perhaps more interesting and useful site is the one by the company who has the boating and snorkeling concession at Pennekamp Park. You can tour the reef on a 65-feet (20 meter) glass-bottom boat, rent a boat yourself or do any of many other fun things. 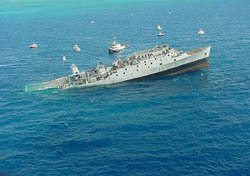 Key Largo is the home of the Spiegel Grove, the largest vessel ever intentionally sunk as an artificial reef. The vessel is 510 feet in length, 84 feet wide. She lies on her starboard side at Dixie Shoals just off of Key Largo. Most of the Spiegel Grove can be explored at depths of 50-85 ft, but you can also see it just by snorkeling. Above you see pictures of the ship while being sunk (May, 2002) and what it looks like now. The sinking itself was a fiasco - the ship sank on its own, hours before it was due to be scuttled. It rolled over and landed upside down. It has since been set upright. It is a difficult dive, and not to be taken lightly. 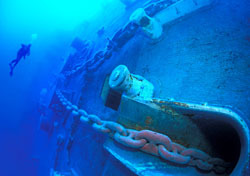 Six people died diving on this wreck in the first ten years since it was sunk. 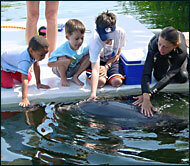 Dolphins Plus offers in-water interaction with bottlenose dolphins. It costs several hundred dollars, but if it is one of the few places in the world that you can do this. See their Tripadvisor reviews . The Florida Keys Wild Bird Rehabilitation Center works to rescue sick and injured birds, and uses educational programs to help prevent future injuries to birds. They are always looking for volunteers, interns and others to help them. The Monroe County (=Florida Keys) Tourist Development Council offers a very good calendar of events covering all the Florida Keys. Driving south and leaving key Largo, you will enter the town of Tavernier. Tavernier is conveniently located between Key Largo proper and Islamorada. Did you notice a sign along the road when you drove into Key Largo that said "Rock Harbor"? If you turn around and leave Tavernier you will see the same sign as you go north. Let me know tell you the background to the name "Rock Harbor". This is a real-life example of life imitating art !! In 1870, a post office named Cayo Largo existed in the present day Rock Harbor area. The 1870 census population of the island of Key Largo was 60, and documents from 1881 indicated a community of "about two hundred" people . And Key Largo has continued to grow from there.